When one solves numerically partial differential equations, using finite element methods, soon or later will encounter with the concept of isoparametric elements. My goal here is not to explain the concept (I assume you have an idea), but to provide the solution to a problem that I faced up recently: I had to convert parametric or natural or local coordinates to global and vice versa. 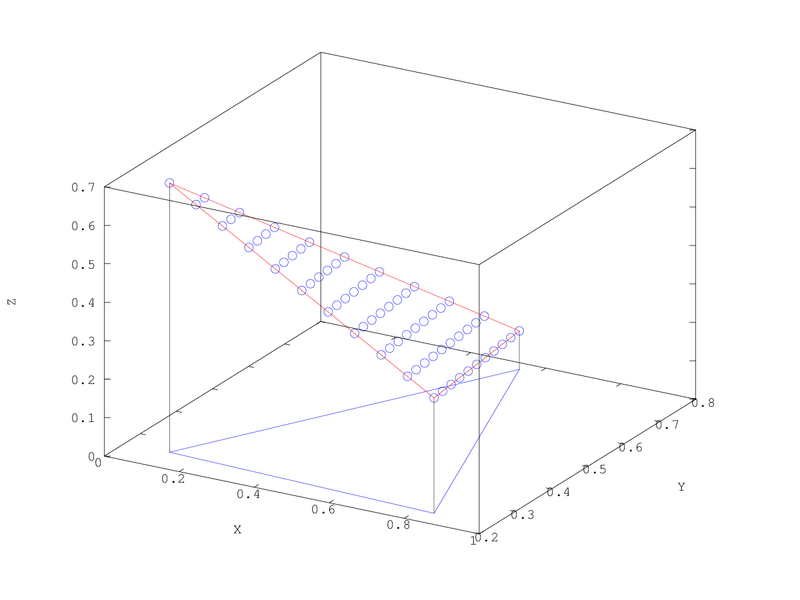 Every point in a domain is characterized by its coordinates (x, y ,z). These coordinates are called global. However in real applications it is not easy to work with the real or global coordinates, therefore it is common to use another coordinate system, where the location and the values of each point is a function of the location or values of the nodes of the element that contain the point. In other words we interpolate the value of a point from the values of the point corners. The parametric variables usually span within [0 1] or [-1 1]. Below is a small matlab/octave code that may help you to understand the concept of parametric variables. We see that we can interpolate the height value of every point within the triangle using very simple calculations. So far we showed how you can find the global coordinates of a point if you know the local ones. Generally this is a straightforward task, yet the opposite can be cumbersome. Bellow I will explain a general method where using the symbolic toolbox of matlab this becomes also a trivial task. For a 2D triangle the problem is stated as follows, given the three corners of a triangle (x1,y1), (x2,y2), (x3,y3) and the coordinates of a point (xp,yp) find the parametric coordinates (u,w). and then we solve a system of two equations with two unknowns (u and w). This is actually something that matlab symbolic toolbox is very good at. The outcome of the last command is a structured variable with fields u and w, which contains the solutions for u and w.
Of course for the 2D triangle one can derive these formulas using a different approach. Quadrilateral elements are any kind of four point convex polygons. The parametric variables u, w in that case span from -1 to 1. 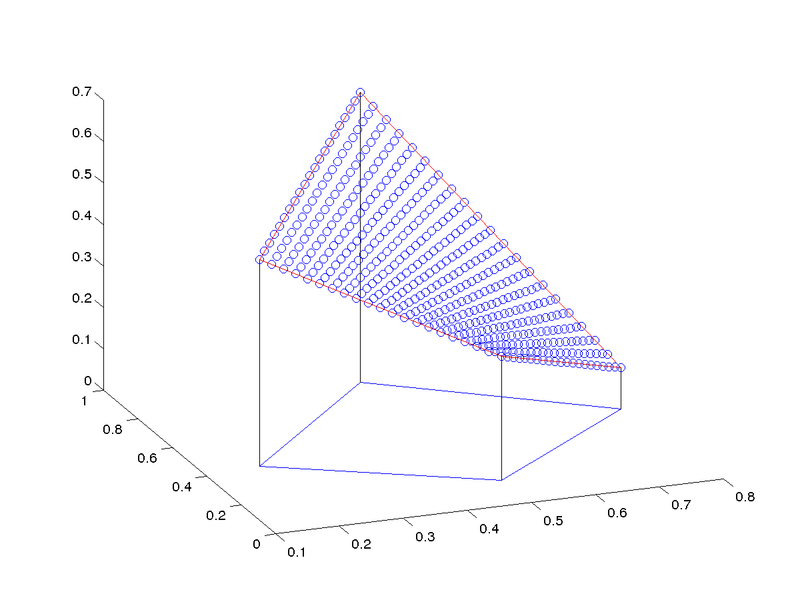 You can see that for the quadrilateral the interpolated points do not lay on the same plane. If we try to solve this system we will end up with huge expressions. Personally I find it impossible for me to carry out by hand all the calculations without making mistakes. All we have to do is to tell matlab to try to solve the system. You will notice that there are two solutions. and you have to try which ones gives the desired outcome( in my case it was u=S.u(1) and w=S.w(1)). You may also notice that both expressions of u and w are extremely lengthy! In the code below, first you pick four corners (make sure the polygon is convex). Next you pick two points in the global elements. 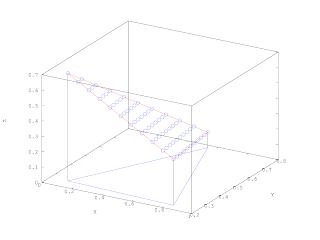 The code plots few points along the line defined by the to points and the transforms the global coordinates to local using the symbolic solutions. (Note that the evaluation of the symbolic expression can be significantly slower, therefore in real application it is highly recommended to copy paste the expression in the code). Finally the few points along the line are plotted in the local system. In the example the letter A looks upside-down in the local space because the first point of the polygon is the (46, 92) top corner. The first corner corresponds always to the corner with (-1, -1) in the local system.